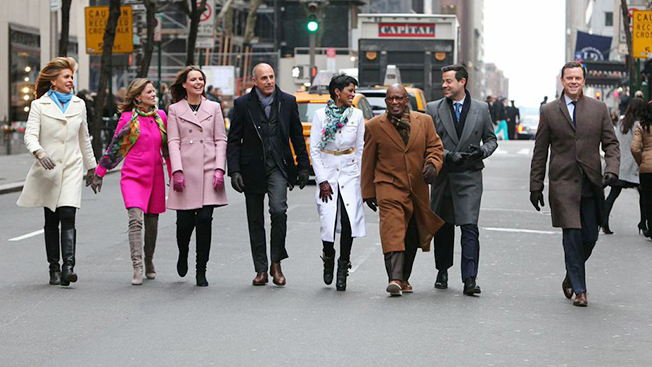 It was a chilly 28 degrees outside 30 Rockefeller Center, but Today Show hosts Matt Lauer, Savannah Guthrie, Al Roker and Natalie Morales were all smiles as they walked down New York's Avenue of the Americas. They were filming their Super Bowl commercial, which will air as an in-house promotional ad guaranteed to NBC as the game's broadcaster. "Wow they're so much better looking in person!" one onlooker exclaimed. The Today Show invited director Mat Whitecross to create a 30-second TV spot inspired by his music video for A Sky Full of Stars, which has been viewed on YouTube upward of 63 million times. During the Coldplay music video, lead singer Chris Martin and the rest of the group walk through the streets of Sydney dressed as one-man bands. Slowly, members of the public join the musicians on their stroll, eventually ending in a live performance. The Today Show licensed the track and asked Whitecross to re-create that experience for its Super Bowl ad. "What everyone seemed to respond to at the Today Show was the sense of fun and joy that came out of it," Whitecross said. "It was really just something to try and communicate that sense that everyone is part of the the Today Show show, that sense that you tune in, you become part of the family, and it lifts you before you go to work." Instead of using paid media to get people to show up for the shoot, the Today Show relied on good old word of mouth and modern social media to build online buzz for its campaign. The morning program has had a huge social media push lately, including its ongoing Orange Room initiative which highlights online chatter around its show. Its #Rokerthon was a successful attempt to have the longest uninterrupted live weather report, clocking in at 34 hours, and also acted as a crowdsourced Crowdrise campaign to fundraise for the armed forces. "Finally you can actually hear what people think," Today Show third hour co-anchor Tamron Hall said about social media. "Sometimes you're in that bubble or glass studio. Sometimes it's nice to get instant feedback. We've already been tweeting out some stuff [about the Super Bowl shoot] from here." To promote the Super Bowl shoot, it tapped its Plaza Initiative, a digital database of Today Show visitors that keeps tabs of anniversaries and any other special events so it can personalize experiences, like having anchor Matt Lauer personally come by and wish them a happy birthday. Via Plaza, the show invited everyone in the tristate area to come down to Rockefeller Plaza for Wednesday's shoot. Within the first 30 minutes, 50 people RSVPed, with a total of 200 people eventually responding. Also, details about the shoot were posted on social media accounts using the hashtag #risetoshine, with NYC affiliate WNBC socializing ahead of the event. The street scenes remained relatively quiet until right before the shoot, though; the aim was building natural, real-time buzz. Throughout filming, again via Plaza, the show posted photos and tweets using #Risetoshine on its Facebook and Twitter platforms and hosts tweeted unfilmed moments from their personal accounts, like a sing-along session on the team's bus. Throughout the day, more people showed up, to the point where it was unclear who was an extra and who was a member of the public simply stopping by for a selfie. "We go out on the plaza and no one asks for autographs anymore. It's all about the selfie. That's the new autographs," Today Show fourth hour co-anchor Hoda Kotb explained. At one point, Guthrie, Roker and Morales ended a scene in a dance party with members of the public. Later, someone offered Roker a slice of pizza, which he gladly gobbled down. It became clear later that it was not staged when that person never appeared again in subsequent shots. Not everything was usable: Mixed in with the excited expressions were puzzled onlookers and genuinely annoyed New Yorkers who were upset someone was blocking the sidewalk. Still, Whitecross said that fit in with his vision for the video. Though they hired extras and played music so the journalists would have something to react to, he wanted to leave room for things to organically occur. "What I was hoping is let's the keep the camera rolling, let's not call cut and hopefully spontaneous things are going to happen," he said. The Today Show will build buzz for its ad ahead of the Super Bowl by posting an extended version of the 30-second spot on its social media pages, as well as a behind-the-scenes video of the shoot. It also hopes to use the momentum to continue promoting its #RisetoShine initiatives. "[Social media is] everything now," Lauer said. "It's unbelievable how much is required of you and expected of you. Some of us are better at it than others, but that's how people in the audience want to be connected to us on TV."